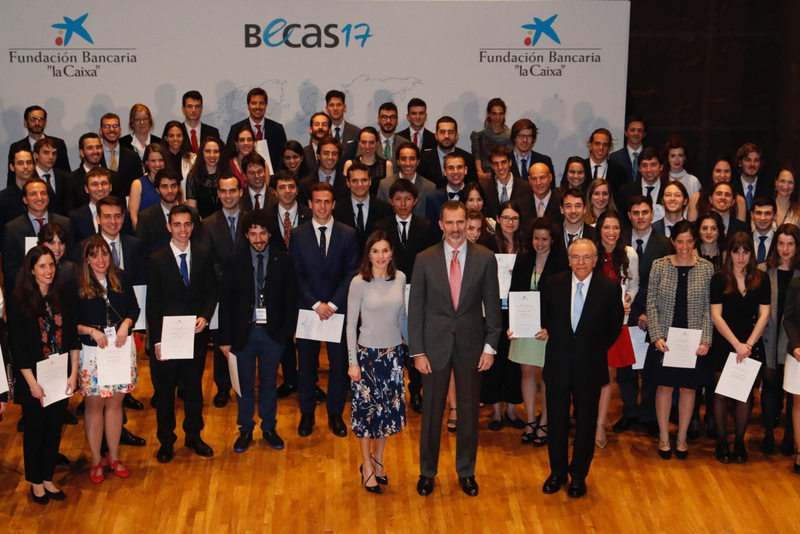 King Felipe VI and Queen Letizia of Spain today presided over the act of granting “la Caixa” scholarship granted by the “la Caixa” Banking Foundations to the 120 selected students, in its thirty-sixth edition, to pursue postgraduate studies in the best universities in the world. With the aid of “la Caixa” Banking Foundation students will be trained in some of the most prestigious academic centers in the world: 65 to study at universities in Europe, and 55 for North America (United States and Canada) and the Asia-Pacific region (Australia, China, Singapore, Japan, India and South Korea). 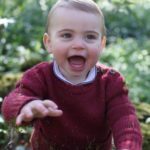 After their Majesties arrival, Emilia Jordi, host of the event, Javier Ventura-Traveset, spokesperson for the European Space Agency in Spain and intern from the United States in 1990 opened the event. King Felipe and Queen Letizia granting the scholarships to the students in the auditorium of CaixaForum Madrid. The scholarships of “la Caixa” are awarded in competitive competition. Applications must pass a first evaluation phase through the peer review system, and all those that receive the best grades are called for a personal interview. In the selection process, university professors with international experience participate in this type of evaluation process. The selection criteria take into account, among others, aspects linked to the excellence of the projects. Both the number of applications received and the rigor and level of requirement of the selection processes ensure that the candidates finally selected accredit outstanding levels of excellence. Letizia at the event with the winners. 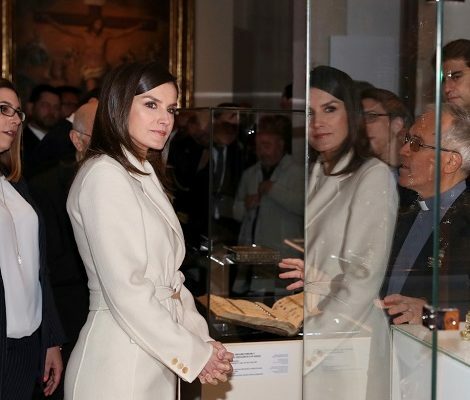 For the youth oriented activity, Queen Letizia chose a very modest yet chic style with elegance. 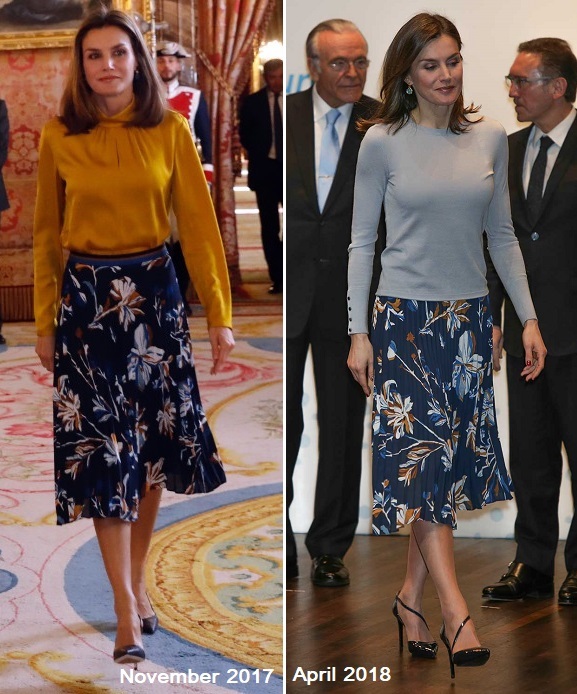 Letizia brought back the navy floral Hugo Boss BOSS ‘Viplisa’ pleated skirt first worn at a luncheon for the visiting President of Palestine last November. 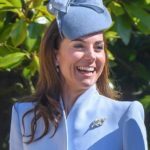 This time Queen paired the skirt with an ice blue knitted top from Hugo Boss. The BOSS ‘Frankie’ cuff detail sweater knitted in a merino-quality mercerised virgin wool is finished with metallic buttons at the cuffs and features a slim crewneck. The sweater is already sold out. 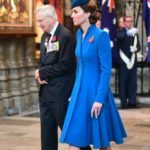 Queen teamed up the today’s outfit with her bespoke navy Magrit cross-strap patent leather pumps and carried CH Carolina Herrera ‘Baret’ flap clutch bag in navy leather. 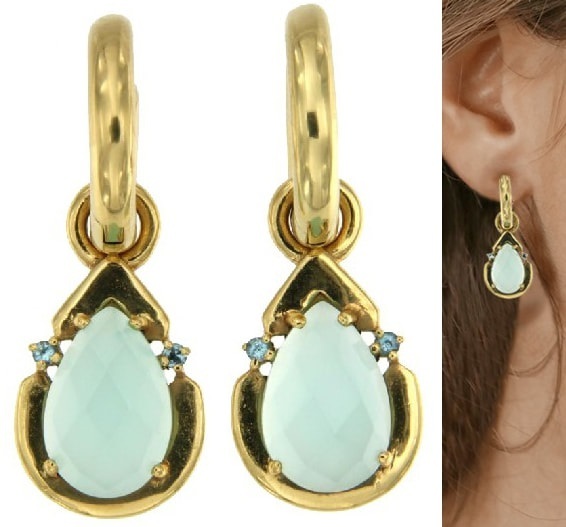 The new release wardrobe piece for today’s look was the pair of earrings from her go-to Spanish jeweller Coolook. 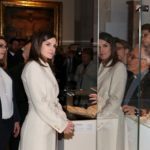 Letizia wore large pendant featured in a Chalcedony teardrop stone in a gold-plated setting with two topaz gems on either side hanging from gold-plated hoops from the brand’s ‘Rain’ collection. Both hoops and stones can be bought separately as well as the combined piece offered at CooLook.